The founders surname was Hao, named; Lin and styled Tai Gu (Great Antiquity). His assumed name was Tian Ranzi (Tranquil Master). 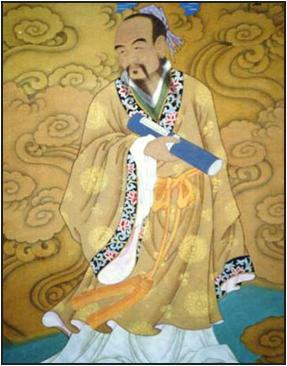 Hao’s Teacher of the Complete Perfection School was Wang Chongyang (1113—1170), who bestowed him with the sacred name Datong. Master Hao also had another alternative name, which was Guang Ningzi (Master of Expansive Serenity). He was a native of Wendeng county, Dengzhou prefecture in Shandong province. Master Hao was born in the Song dynasty during the 10th year of Emperor Gao Zong’s reign (1140). He died on the 30th December 1212, at the age of 72 and ascended to the land of the immortals. After his death, in 1269 Emperor Shi Zu of the Yuan dynasty handed down an imperial edict conferring upon Hao Datong the title of Guangning Tongxuan Taigu Zhenren (Perfected Man of Expansive Tranquility & Pervasive Mystery of Great Antiquity). Which later, in 1310 was appended to Guangning Tongxuan Taigu Zhenjun (Perfected Lord of Expansive Tranquility & Pervasive Mystery of Great Antiquity). Master Hao Datong is the Mount Hua Sect’s founder and first ancestor.